Attention fans in the US: Series 3 of Bluestone 42 is coming to Hulu in May! If you haven’t caught up on the series due to streaming issues, now is the time. Starting on May 1st you can watch all three series of Bluestone 42 on Hulu Plus! Thanks to Victoria for the tip! In another new interview promoting Ripper Street, which begins streaming on Amazon Prime UK today, Matthew talks about the show as well as trying to get a role in Game of Thrones. We would totally be up for that! There are a few characters who haven’t yet appeared on the show that he would be great for. Who wants to start the petition? “I’ve seen a bit of the first season and a bit of the second, and I’ve read all the books, so I’m a big fan of the story. I’d definitely jump at a chance to be involved in that. As a fan of George R. R. Martin’s A Song of Fire and Ice novels, who could Matthew, 26, see himself playing? “The series is now ahead of the books so everyone’s been cast,” he says. He also spoke to Yahoo UK about the possibility of a Bluestone 42 film. He says he would definitely be interested if there was story to tell. He wouldn’t want to do a film just for the sake of making a film. 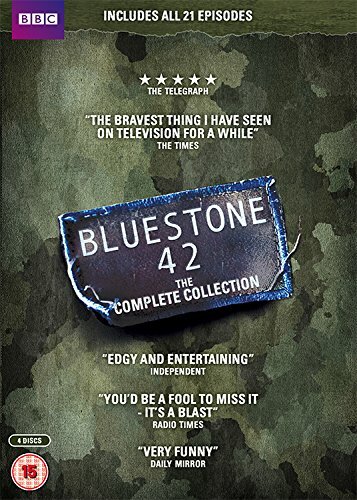 Great news for Bluestone 42 fans who don’t own the series on DVD yet: Bluestone 42: The Complete Collection will be available on November 16th. The set is available on Amazon.co.uk for £34.99 and includes all three series of the show plus the Christmas special. You can also order Series 3 separately for £14.99 on Amazon.co.uk. Unfortunately the set is Region 2, as it’s from the UK, so fans in the US and other countries may not be able to play the DVD if they have a region specific DVD/Blu-Ray player. Thanks AccioMDL for the tip! Bluestone 42 is officially not returning for a fourth series. James Cary and Richard Hurst made the announcement on Sitcom Geek. While we here at Matthew-Lewis.com are sad that the show will not be returning for more hijinks, we can be glad to know that it helped entertain those men and women fighting to protect us. UK fans can purchase the first two series on DVD over at Amazon [Bluestone 42 Series 1; Bluestone 42 Series 2]. Fans in the US who haven’t seen it yet can watch the first two seasons of the show on Hulu Plus. The first season can be watched without a Plus account. We’re sad to announce that Bluestone 42 will not be returning for a fourth series. Overall, it was felt that the show had run its course, with the return of the troops from Afghanistan, and the move of BBC3 to an online platform. Bluestone 42 ran for 21 episodes over three series, was critically well-received, and was repeated on BBC1 and BBC2. Its most recent series achieved higher audience figures than the first two, with a total of over two million viewers tuning in on average each week. We were also proud that many of the cast raised money several times for the Felix Fund, the bomb disposal charity. We would like to thank BBC3 for backing the show in the first place, and giving us the creative freedom to pursue our vision for the first comedy set during a war that was still being fought. We are also very grateful for a superb cast and crew both in UK and South Africa who worked with professionalism, resilience and good humour throughout the process, especially on some very demanding filming days in very hot weather with some very tight budgets. And around some very loud bangs. Everyone can be proud of what we achieved together. Fans in the US will recall that last year Bluestone 42 Series 1 was added to Hulu. Matthew’s character, Towerblock, does not feature in the first series, but Hulu has just added series 2 to their offerings! You can watch both series 1 and 2 on Hulu Plus, which is $7.99 a month. Towerblock joins Bluestone 42 in Season 1, Episode 9 – the Christmas Special.